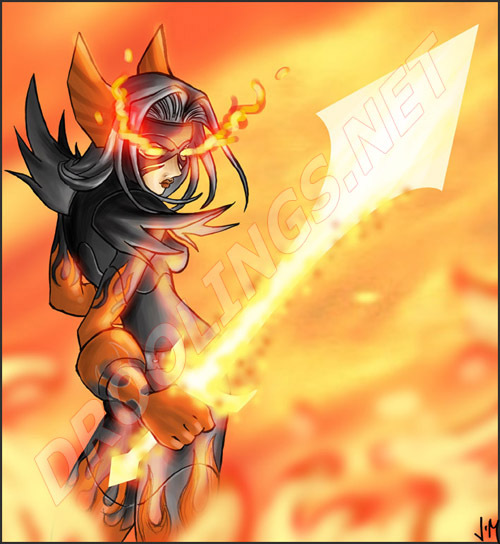 Orina is a Fire/Fire tank in City of Heroes. This picture was done in a competition on the French European boards of the MMO sharing the same name. 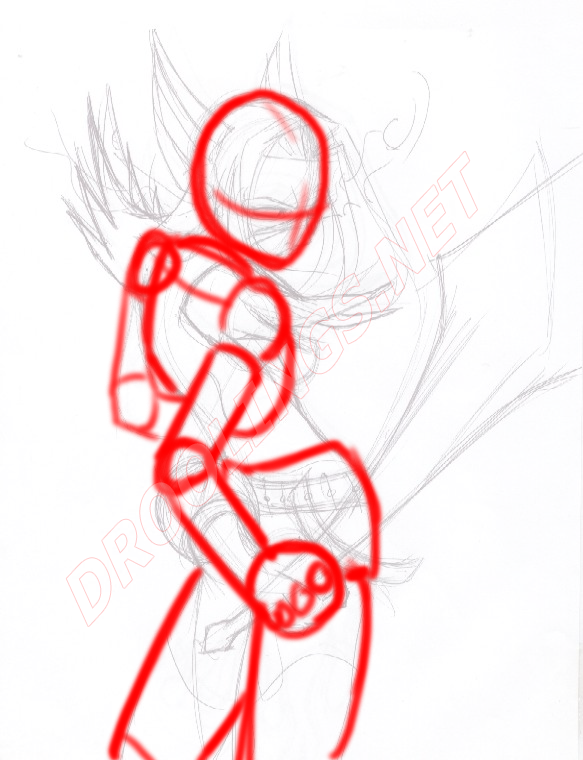 So here I’ll briefly explain the 3 major steps a drawing goes through. 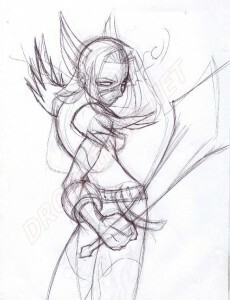 The first step is to come up with the basic sketch. 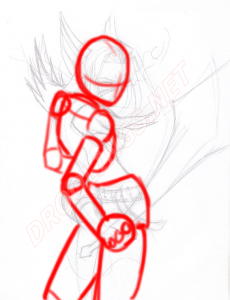 Using a ball pen, I loosely begin by drawing the basic shapes and lines that will help me construct the body base. Those are the most important as I build everything (pose, attitude, clothing, equipment, hair, etc…) from those particular shapes. I’ve made those basic shapes easier to spot by drawing over in red. 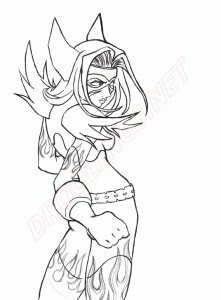 Following are the inked stage of the drawing to create the line art. There are 2 ways I do this. I draw straight on the paper using a calligraphy pen. So I’ll basically trace over and add details. I’ll scan the drawing and ink it digitally using the tablet. The first hands-on method is good to get a better feel for the drawing but can go awfully wrong if you don’ have a steady hand like me – too much coffee will give you a nervous hand! Going digital offer us a way to mess up and undo all these little errors we do. So it’s your choice really. I go with the feel of the drawing. If I really want to ink it and there are no tablet equipped pc’s in the vicinity, I’ll ink it on the spot by hand. 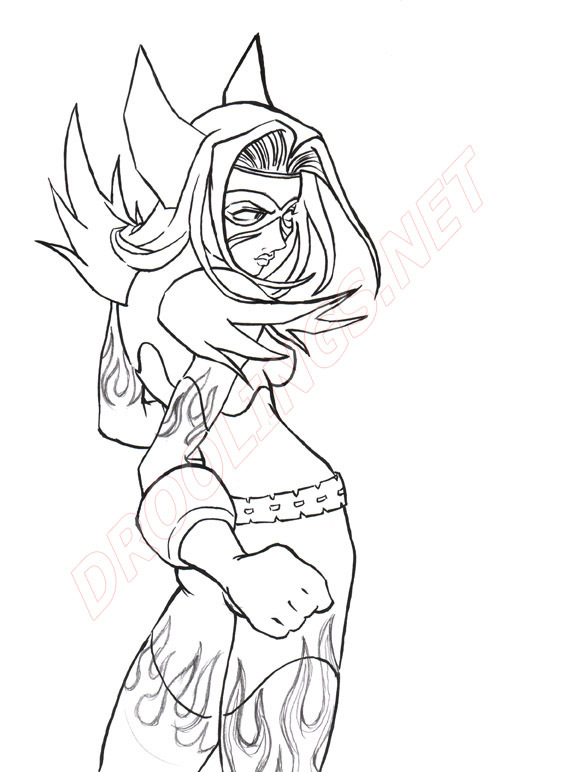 Moving on, I’ll end up scanning the picture now (if that wasn’t done for the inking phase). I’ll duplicate the base layer (some people manage to unlock it). I’ll put the duplicated inked layer on the top of all other layers and in [multiply] mode. The purpose of this is to allow me to add all sort of new layers with colours and filters and still keeping the line art on top of everything else. In this example, the light source is all around really but the focus comes from the fire sword. 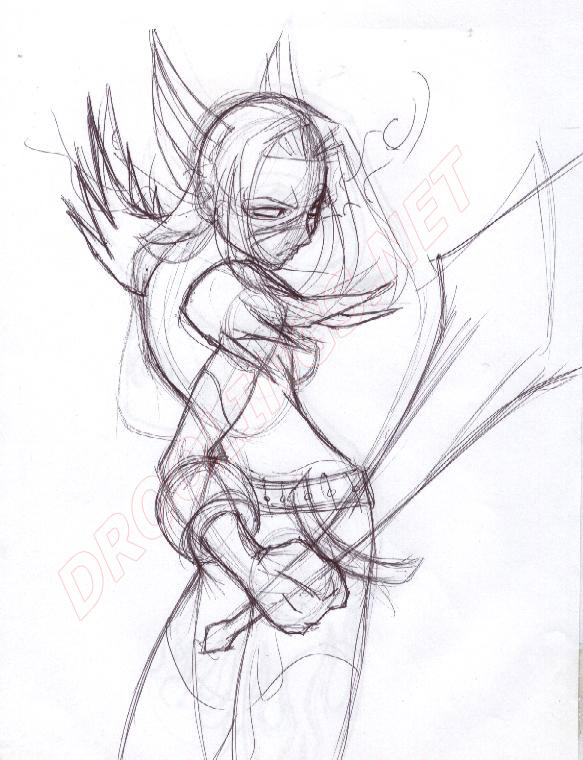 Here is another mistake then: Orina’s back should probably have much more light.